September is designated as Life Insurance Awareness Month. 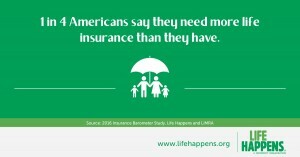 This campaign was initiated by Life Happens, a nonprofit organization whose mission is to “inspire the public to take personal financial responsibility through the ownership of life insurance and related products.” According to the 2016 Insurance Barometer study, 40% of Americans still do not have any life insurance and 1 in 4 people feel they need more life insurance protection. The industry uses this month as an opportunity to educate Americans about the need for life insurance coverage and correct many misconceptions the public believes about life insurance policies. ExamOne is a proud supporter of this initiative each year. As a leader in the life insurance industry, we are committed to making the life insurance application process as easy and simple as possible. Life insurance is an important part of a family’s financial planning and we want to help alleviate any concerns a potential applicant may have. ExamOne’s newly designed applicant website is a great resource that helps explain the paramedical process in detail, answers questions an applicant may have, and provides instructions on how he or she can access their laboratory results. * Through Inside Look, applicants have access to securely view their laboratory results from the paramedical exam. By providing applicants with access to their laboratory results, we increase their health status awareness and they are encouraged to live a healthier lifestyle. Visit ExamOne’s page dedicated to Life Insurance Awareness Month or the Life Happens website to learn more about the importance of family and financial protection through life insurance.